Research and publication play a leading role in nation building as same can often bring about dramatic changes in a country’s scientific, economic, social, political and even cultural spheres. As the national university and Belize’s primary driver for national development, the University of Belize has placed research and publication as the cornerstone of the University. Research “discovers, elucidates and evaluates new knowledge, ideas, and the technologies,” which are essential in creating relevant, responsive and modern curriculums that advances society and industry. This is particularly salient in fostering professional excellence in faculty, an imperative for delivering outstanding student education and training. At the University of Belize, many of its faculty engage in research that are critical to the advancement of Belize and that responds to the national development needs and priorities of the country. Four of such research are that of Dr. Leandra Cho-Ricketts and Dr. Elma Kay of the University’s Environmental Research Institute (ERI), Dr. Kieran Ryan of the Faculty of Science and Technology (FST) and Dr. Romaldo Lewis of the Faculty of Management and Social Science (FMSS). 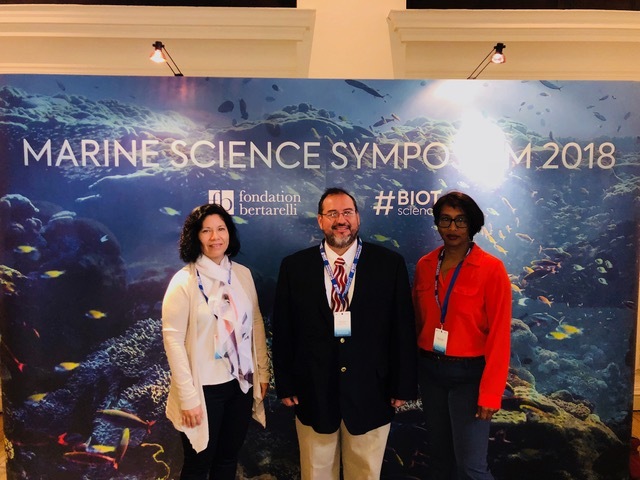 UB’s ERI Science Directors, Dr. Leandra Cho-Ricketts and Dr. Elma Kay, visited London in the United Kingdom from September 10-14th 2018 to attend the Bertarelli Marine Science Symposium. Their visit was hosted by the Bertarelli Foundation to provide an opportunity for scientific exchange. They joined the countless scientists and explorers who have walked the historical halls of the Royal Geographical Society of London, where the Bertarelli Marine Science Symposium was held on September 11th. The team learnt about all the exciting, impressive and cutting edge research being conducted in the British Indian Ocean Territory of the Chagos Marine Reserve, a fully protected Marine Protected Area (MPA). The symposium presented findings on two years of research and exploration in Chagos, which has some similar parallels to Belize’s Turneffe Atoll Marine Reserve since it is an oceanic atoll filled with significant biodiversity and heavy fishing interest surrounding it. On September 13th, the two Science Directors and Mr. Valdemar Andrade, Executive Director of our partner Turneffe Atoll Sustainability Association (TASA), met with a group of around twenty (20) scientists from the UK, Australia and the US at a science workshop where Dr. Leandra Cho-Ricketts shared the ongoing science program of the Turneffe Atoll Marine Reserve and Mr. Andrade gave a summary of the management of the marine reserve. On Wednesday the 12th, the team also met with researchers from Northeastern University in the US to discuss research collaborations for establishing a 100-year climate record for the Turneffe Atoll, which can serve as an international sentinel for climate change within the Caribbean. This will tell how Belize’s reefs have changed over the last 100 years, particularly with increasing impacts from climate change but more importantly, how the establishment of the marine reserve is affecting the health of the reef. The workshop and meetings were very productive with key contacts established for areas of common research interests and opportunities for collaboration to apply technology in filling data gaps and in informing management of the Turneffe Atoll. The UB ERI and TASA team will be following up with researchers from the Bertarelli Marine Science Program, including professors from Stanford University, University of Exeter, University of Western Australia, Zoological Society of London and others to develop a research program with support from the Bertarelli Foundation for the Turneffe Atoll Marine Reserve. UB ERI’s Administrative and Science Director (Marine), Dr. Leandra Cho-Ricketts has contributed a chapter in the book entitled: Coral Reefs: Tourism, Conservation and Management. This chapter, which is entitled Belize Barrier Reef System – A Threatened Biodiversity Hotspot, addresses the numerous threats to Belize’s Barrier Reef System. Below is the abstract for the chapter. The hard copy of this book is scheduled to be released in September 2019. Dr. Kieran Ryan of the University’s Faculty of Science and Technology (FST) participated in the 2018 Global Symposium on ICT in Education, which was celebrated under the theme, “Teaching in the 21st Century: Enhancing Teacher ICT Competencies.” This year the conference was held from 11-13 September 2018, in Seoul, Republic of Korea. The symposium was co-organized by The Ministry of Education, Republic of Korea, UNESCO Asia and Pacific Regional Bureau for Education, and The Korea Education and Research Information Service (KERIS). The objectives of the symposium were promoting ICT competencies in educators, demonstrating innovations in Continuing Professional Development (CPD) for teachers and analyzing methods to measure effective teaching with ICTs. The participation of Dr. Ryan in the symposium was a result of his graduate research collaboration with KERIS and will contribute to the enhancement of UB’s institutional knowledge and practice in regards to the use of ICT for effective teaching and learning as well as to build communities of practice across Belize to promote Continuing Professional Development of ICT use in education. UB’s Assistant Professor, Dr. Romaldo Lewis of the Faculty of Management and Social Science (FMSS), published three (3) academic articles in the International Journal of Management and Humanities (IJMH) and International Journal of Business and Applied Social Science (UBASS) in August and September 2018. In his first publication, entitled “Correlations of the Marketing Return on Sales Investment (MROS) versus the Investment in Marketing of the Micro, Small, Medium and Large (MSMLE’s) Enterprises of Belize,” Dr. Lewis determines the nature as well as the level of correlation that exit between the Marketing Investment (%) and the Marketing Return on Sales (%) and gave recommendations to increase the Marketing Return on Sales (MROS) for enterprises in Belize. His second publication, entitled “Identification of the major constraints that limits the creation, promotion and growth of the Micro, Small, Medium & Large enterprises (MSMLE’s) in Belize,” discussed, from a technical perspective, the major constraints – its nature and level – that limits the creation, promotion and growth of the enterprise in Belize. While Dr. Lewis’s third publication, entitled “Classification of the Micro, Small, Medium and Large (MSMLEs) Enterprises in Belize, Based on the Free Cash Flow (FCF),” evaluated the accuracy level in the classification of the enterprises in Belize and determined the correlation level, or association of the contributing indicators or Factors, in the classification process. These three publications contribute significantly to the growing literature on Micro, Small, Medium and Large enterprise in Belize and will undoubtedly further the discussion on the role these types of enterprises have in developing a healthy business climate, economic efficiency and power for economic development in Belize.